Click the pencast screen above to open/save the PDF file to your computer. to view/listen to the pencast. Click anywhere on the screen to go forward/back to any point in the pencast. If you need a written transcript, it is below or click here for the text file. There are two active kinds of bone cells we need to know about. The first one is the osteoblast. The word part osteo means bone and the blast ending is important because that means to make. So an osteoblast is a bone maker, meaning that it’s releasing a fluid containing calcium ions that is going to encrust on the collagen fibers. So basically it’s hardening the bone or ossifying the bone, that is, converting a softer tissue into bone tissue. So we can call it a bone maker. The osteoclast, on the other hand, is a bone breaker. That is it dissolves the hard bone matrix and allows that calcium solution to diffuse back into the blood supply. So we can look at these cells as having two major effects and we can illustrate that. Let’s take a look at one of these cells. 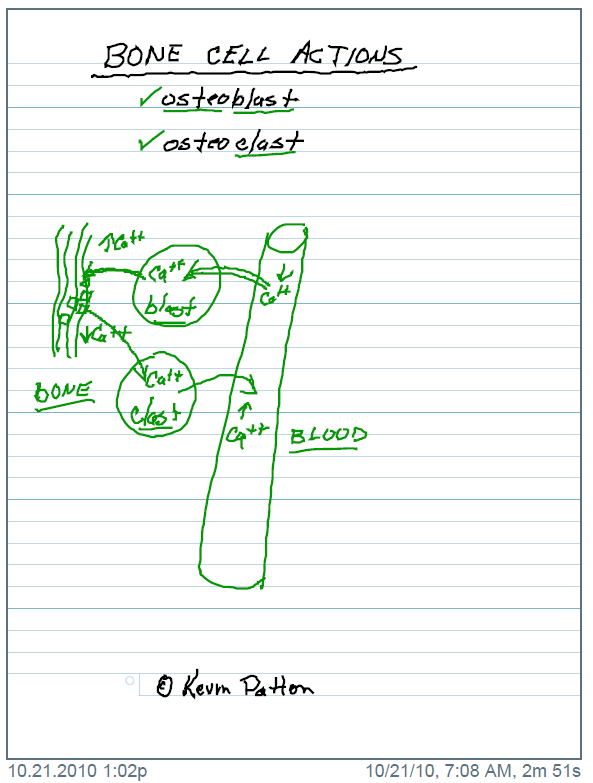 We’ll call this the osteoblast and we’ll think about the blood supply and we’ll draw in a weird looking blood vessel. And let’s draw some collagen fibers here in the soft tissue. And what the osteoblast is going to do is draw calcium ions out of the bloodstream and then produce a solution that’s going to cause little crystals to encrust on the surface of these collagen fibers. So the osteoblast is doing two different things with one action. That is, it’s drawing calcium out of the blood supply and then it’s putting calcium into the bone tissue. Now on the other hand let’s look at the osteoclast. The osteoclast is going to be dissolving these hard mineralized crystals, thus bringing calcium out of the bone and then putting it into the blood supply. So what we can say about this is that the osteoblasts is increasing blood calcium in the bone at the same time it’s decreasing the calcium ions in the blood. Now when we look at the osteoclast, we can say that the osteoclast is decreasing the calcium level in the bone and its increasing the calcium level in the blood supply. So these cells are having an effect on both the bone and the blood and therefore the going to affect the situation in both tissues: the bone and the blood.